From the beginning, we decided that a cow that did not breed and raise a calf every year would not be productive in our herd. Our herd has been 100% AI and ET since we began in 1985. Fertility had to be the number one selection criteria in our herd. 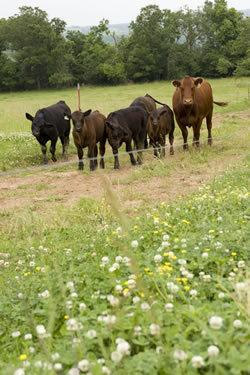 Our Ozark Mountain pastures are rocky with thin soil. A cow must have a good udder as well as good feet and legs to stay sound on our rocky pastures. Our quality of soil and rock cannot support cropland or lush alfalfa pastures. We do get lots of rain and sunshine but that also means high heat, humidity and lots of low quality grass. Our cows had to be efficient processors of poor quality forage. It became clear that our cows had to raise a calf and breed back every year utilizing the forage available and look good doing their job. Efficiency became an important selection criterion in the Sugar Springs herd. It also meant breeding the type of deep bodied cow that can survive on forage alone when necessary. We have also found that when given grain, the progeny will excel in giving an excellent eating experience. Our prime aged beef is marketed through local restaurants as well as directly to customers. We have practiced environmental stewardship since our ranch was started in 1984. A prolonged drought forced us to find an even better way to care for our land. We started with cell grazing to help our drought stricken pastures in an attempt to stretch what little grass we had. This type of grazing was new to the US back then and so we had to be very innovative in what we tried. Years of managing our pastures now have our land supporting a stocking density of a cow/calf pair per 2 acres. We have available for sale cows, heifers, show heifer prospects, embryos, bulls and finished steers as well. Feel free to tour our Donor cows as well as view some of the photos of our accomplishments in the show arena. Our grand champion cows reflect breeding generations of the deep bodied efficient mothers that can survive in the native pastures yet excel in the show ring. We have breeding age bulls available ready to turn out, not pampered but raised like they will be used. 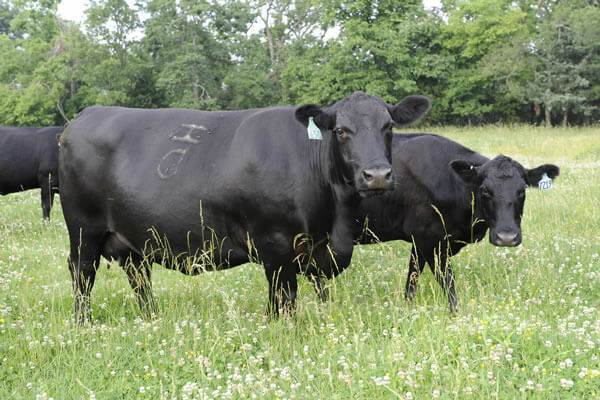 Our finished beef is raised humanely, antibiotic and hormone free and processed at a USDA inspected packing plant.